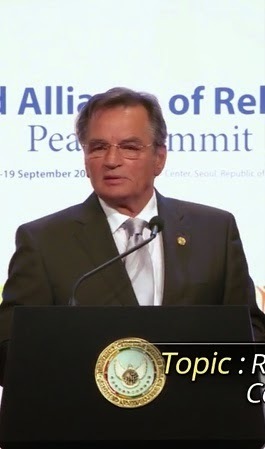 Organized by HWPL, the World Alliance of Religions for Peace today in Seoul begins World Summit of Peace, which is attended by more than 100,000 members of HWPL. At the Peace Summit are invited Dr. Haris Silajdzic, a former member of the BiH Presidency, Stjepan Mesic, former Croatian president and Zoran Zivkovic, former Prime Minister of Serbia. The program envisages that Dr. Silajdzic at the Peace Summit is participating as a VIP speaker, Moritz Leuenberger next to the former president of Switzerland, Emil Constantinescu, former President of Romania, Marisol Espinoza Cruz, Archbishop Antonio Ledesma. World Conference of Religions for Peace is always looking for new forms of convergence, dialogue, solidarity and co-existence, and the creation of lasting and positive change in the world by bringing together different communities around the world essential task. Speakers and delegates of this kind of peace plan for humanity as leading politicians, diplomats major, leading government officials from around the world. At the summit will address the challenges, responsibilities and opportunities of world leaders in building a world of peace, reconciliation have, the application of cultural diplomacy in inter-religious dialogue, to resolve the conflict by compromise, and the role of personal and common as a power source of identity and unity. This, so far the most representative and most numerous summit of world peace will open Man Hee Lee peace maker, known advocate of peace and peace organizations HWPL president, said the press service of the Party for BiH.